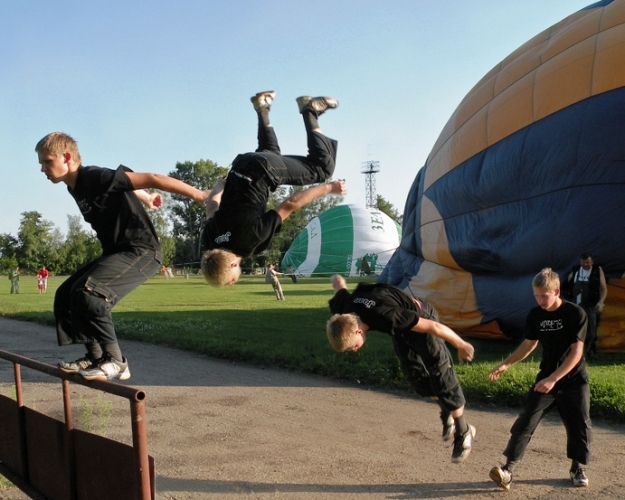 Flip is one of the most spectacular stunts in acrobatics. In order to learn how to do it at home, you need a good physical preparation and the correct sequence of training. In order to successfully perform flips, you need to have a flexible and trained body. So before you begin this trick, experts advise to strengthen the muscles through traditional sports such as gymnastics or swimming. Once the muscles will attain the right tone, you can start to learn to tumble. But not in the air, and first on the Mat. This is necessary in order to allow the body to remember the mechanism of action, as well as the necessary groups of muscles sufficiently warmed up. In order to make a proper roll is essential to keep your feet together, hands put forward, bend the head to the neck and do a forward roll. Do this exercise smoothly, without jerks, otherwise can stretch the ligaments or damage the vertebrae. After a forward roll you will turn out without a hitch, you can try to tumble in the air. It is necessary to take a few mats, put them on top of each other, and follow the following algorithm: run, jump in front of the Mat and make the now familiar roll forward, but only in the air. Try to keep the landing occurred on the feet. Flip is a complex exercise, make it the first time is virtually impossible. The more you practice, the sooner you will learn how to cluster and to shift the center of gravity to flip was perfect! If during exercise you experience any difficulties, you can turn to professional coaches for gymnastics or parkour - they will help you see mistakes and give recommendations on how to learn how to perform this trick yourself! 1. Flip - traumatic trick. If improperly performed it can end up in severe injuries of the skull and spine. That is why in its execution, it is important to observe safety precautions. 2. Before beginning execution, you must carefully flip to warm up the muscles! If you have the desire to learn how to do Salto backwards (backflip), we can tell you how to realize your desire. It is necessary to warn that even with strict adherence to all instructions and recommendations can not protect you 100% from injury. So learn to make the flip better in the gym on the trampoline or on the mats. Also preferably insuring the presence of a comrade. First practice to perform two exercises:- Slightly bent, jump up and fully straighten the body and stretch the arms up; Again, jump up, but with the group immediately after the push legs push the knees closer to the shoulders, and just before landing, lower the legs. With practice jumping, move on to learning flips back. First, stand in initial position: slightly bent, bend your knees (only slightly), lower your arms slightly and bring them back. As much as possible push off from the floor, and also simultaneously make a powerful stroke with my hands up (this is the most important moment in the performance of the reception). Immediately after push the legs straighten with your hands. Although you straighten up you get only for a moment. Right after completing the above steps, you can easily take a back. For this you will need to regroup: bent leg press to the body and hold their hands. Eyes don't close – you have to control your position in space. If you look directly in the center of himself, that during a revolution you need to start doing the Ungroup when you see Paul, in that moment perpendicular to your look. So, press from the chest and legs, then slightly bending them, landing directly on your toes. Keep your balance. To prevent damage to the joints do not land on straightened legs. That's all the instruction. Don't be afraid to flip back. Let the first instinct of preservation and takes over you up and overpower yourself. And then it will be easier once you understand what to do flip ago not scary. Basketball is a entertaining and fascinating sport where you can achieve some heights only under the condition of constant training and effort. To be successful and achieve good results athlete developed the necessary skill of high jumping, as it is often the height of your jump in basketball is becoming a decisive factor in the victory. 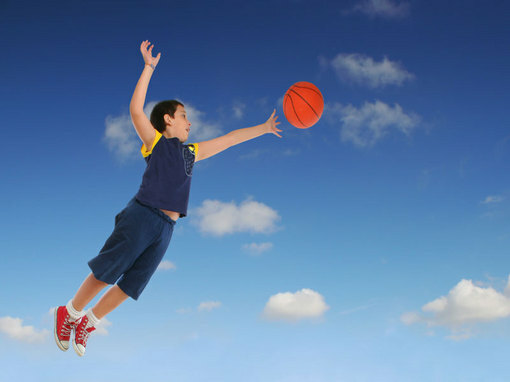 To increase the vertical leap can, regularly performing a set of special exercises designed for basketball players. To start training always need stretching to prepare muscles for exertion. Within five minutes jump rope, run or jog on the spot. In the process of stretching make sure to stretch your joints and muscles, trying not to miss anything, to prevent injuries. Well stretched out, begin to jump vertically on one leg, holding the leg to the breast at the time of the jump. Do the ten jumps, then rest and repeat the jumps. The whole exercise consists of five sets of ten jumps each leg. Another exercise to increase the length and height of jump is called a "Frog." To run it do a full squat and try to jump forward as far as possible. The exercise consists of four sets of fifteen jumps each. Then perform the exercise on acceleration - make the acceleration to 50 meters ten times in a row, resting between sets of 20-30 seconds. You can also make the acceleration to 30 meters 15 times in a row. Do speed jumping up at the expense of calf muscles. Within a minute jump as fast as you can on one leg, then change legs and jump on the other foot for one minute. Repeat on each leg three times. Bounce to a height of 10 cm. Follow eighty jumps up and against the point of the jump to the chest with both feet. Divide the jumps for four series, between which arrange a small vacation. Stand with your back to the wall and put behind a basketball. Bend your knees 90 degrees, squatting, hold the ball between your back and the wall. In the sitting position keep the ball for 10 minutes, then relax. Repeat five times. Doing these exercises four times a week, gradually increasing the load you increase the height of their vertical jumps. Sports where is required the aforementioned skills, a sufficient amount of. But the focus is still on the game program such as basketball or volleyball. That's really where-where, and there really is vital to be able to jump high. Especially given the height at which a net is attached the ring to the ball. That is why experienced trainers follow a few simple tricks that help the athlete to develop the necessary muscle groups. The easiest and very effective way to use weights. You should start with the belt. But there is one "but" - to run such a unit on the body not quite convenient. Yes, and not safe. Because thanks to the belt, increasing the mass of the athlete, which in turn increases its kinetic energy while driving. This is, firstly, reduces the maneuverability and mobility of the player, and secondly, in the collision injury will be more serious. It is in order that no one was hurt, even basketball players, wearing the weight belt, you should get to play volleyball. What is the fundamental superiority of this game before basketball? It does not need to run a lot, and the risk of collision of players is minimized. And given the fact that the grid is stretched pretty high, players will often jump to catch the flying ball. It contributes to the development of the leg muscles, hip, back, waist and abs. Plus develops endurance of the players. When such weight aggregates are removed, make high jumps will be much easier, because the muscles will have time to get used to the weight which they had added a belt. Jumping in the height, which beckons like the sky, not so easy to knock off course in heavy physical workouts. Day after day, they mercilessly train your body to achieve tangible results. Thus, the set of specific exercises helps to increase the height of the jump, you only need to develop the right program loads on your body. Jump height of the involved calf muscles, thighs and back. Right when you jump the grouping of the body, which involves these types of muscles will achieve in the literal sense. For the development of selected muscle groups need to lose weight, eat healthy foods and perform exercises. Do loads to get rid of body fat and increase muscle mass for better coordination. To do this, swing the lower and upper abs and oblique muscles. Lie on a hard surface, fix the feet so they did not rise, his hands squeeze at the elbow and lay over the neck and do the first 10 exercises in the left – touching the tip of the left elbow, the tip of the big toe of the right foot, then 10 exercises to touch right elbow to left leg. Pull up and exercise. You can first do push-UPS on the palms, then fists, if possible. Eventually move on to push-UPS with one hand when the other laid back. It will quickly pump up the triceps. Chin-UPS and push-UPS do a little in several approaches, gradually increasing the load. To pump up thighs using squats with a barbell. Here it is necessary to consult with a fitness trainer in the gym to adequately calculate the weight of loads on your body. The development of the caviar muscles the hardest. But to train them and is possible to pump very often, as they quickly regenerate itself from stress. To inflate, usually raise the toe of the feet with the cargo. Just Jogging or jumping rope will also help to develop rather jump in height. Jumps in length – a full-fledged sport that is not as simple as it seems. 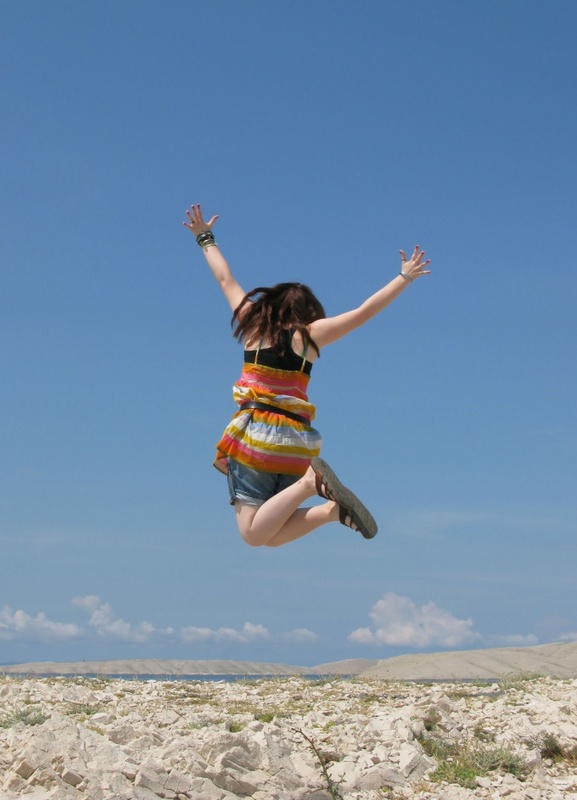 Anyone can jump, but not everyone can achieve in jumping is really serious results. In order to jump far enough, you need to exercise regularly, to develop strength, speed, takeoff, jumping ability and agility. During a long jump, you pick up speed, moving in a horizontal plane, and then transform this power to jump in a vertical plane. In order to make this possible, the athlete needs to fully develop. To begin with, remember, what are the stages of the long jump. The jump begins with a run, and then you push down on the ground followed by a flight phase and the landing. For women the length of the run must be equal to 30-35 m, and for men 40 to 45 m. For the maximum length run you need to learn how to gain maximum speed for short distances. Before you take a comfortable run-up starting position – place one foot slightly ahead of the other at the control mark. Also on takeoff you can go from an easy walk. During the run begin to gradually increase the speed to reach the maximum at the moment of push off the ground. Ensure your body while pushing it in a vertical position, and the leg you push off from the earth, was tense and bent in all the joints, throwing the body of inertia up. Flight leg point sharp movement forward and upward, with one hand take back and the other forward and upward. Straighten the knee the leg flapping and her hands hold the balance in flight. Closer to the landing down the flight feathers of the leg, tighten to her shock foot, pull your knees up to your chest and put your hands down and back. Straighten your knees and move them forward as much as you can. When landing, bend your joints and slightly tilt the torso forward. For successful execution of the jumping exercise regularly, run on a short distance, measuring the result and jump high with a running start. In training you have to include a General warm up with slow Jogging and stretching, sprints, long jump from place, which are carried out in several stages with a gradual increase in distance, jumps, jumps with a running start, running from a low start, Jogging. Young boys, even as grown men, never miss this great opportunity to showcase your athletic achievements and skills. Because the strength, flexibility and agility are the required characteristics of a real man. So how do you learn to do a somersault in home conditions? This is far from easy, for this you need some preparation and a good mentor. - a Mat or blanket (for insurance). If you've never played sports, you will find it difficult to cope with the task. 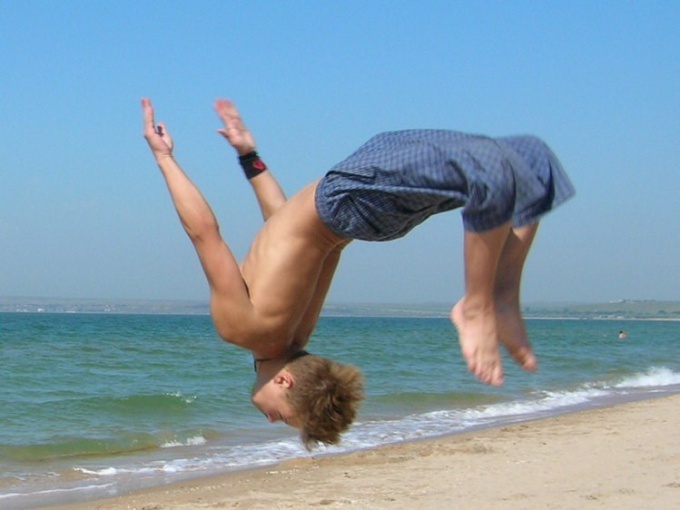 To learn how to do flips, you should be able to control your body and have well-developed motor coordination. If the data quality is not given by nature, will have to work hard on yourself and develop them. To start, mash thoroughly, shake hands and feet. Then try to make an ordinary roll forward: feet should be together, hands in front of him, head slightly retighten and kuvyrknutsja. Perhaps, the first attempt does not work perfectly, so you need to practice a lot to control your body and feel the full force of the muscles. Repeat ten to fifteen rolls. Lay on the floor mats (if available) or a blanket. Main thing is to believe in yourself and, of course, insurance. To perform a front flip from a running start, before direct push with both feet raise your hands. At the time of push hands go down, you twist. In flight, try as best you can to regroup and pull your knees to your shoulders. Tuck tuck your chin to your chest, keep your knees - so you will avoid injury to the person's knees during a landing. Back flip from the wall is performed with a running start. Running to the wall, put on the surface of the foot and just lean back. Take the thigh up, the body should adopt a perpendicular position (relative to wall). Immediately place the second leg (near the first leg) and take a small step from the wall. A good twist to make a powerful swing hands back. At run time, flip back necessarily reject the head back - this contributes to the good promotion. If you do not reject the head or not enough to reject, you can fall into the neck. Land on slightly bent legs, so as not to damage the knee joints. Do not slow down during the execution of the somersault, develop momentum with a running start.